Vayots Dzor (Armenian: Վայոց Ձոր, [vɑjˌɔt͡sʰ ˈd͡zɔɾ]), is a province of Armenia. It lies at the southeastern end of the country, bordering the Nakhichevan exclave of Azerbaijan in the west and the Kalbajar District (de jure part of Azerbaijan, de facto controlled by the unrecognized Nagorno-Karabakh Republic) in the east. It covers an area of 2,308 km2 (891 sq mi). With a population of only 53,230 (2002 census), it is the most sparsely populated province in the country. The capital and largest city of the province is the town of Yeghegnadzor. The province is home to many ancient landmarks and tourist attractions in Armenia including the Areni-1 cave complex and Areni-1 winery of the Chalcolithic period, the 8th-century Tanahat Monastery, the 10th-century Smbataberd fortress, and the 13th-century Noravank monastery. Vayots Dzor is also home to the spa-town of Jermuk. The village of Gladzor in Vayots Dzor was home to the 13th and 14th-century University of Gladzor. Literally meaning "the valley of sorrows", it is named after the Vayots Dzor canton of the historic Syunik province of Ancient Armenia, ruled by the Siunia dynasty. Situated at the southeastern end of modern-day Armenia, Vayots Dzor covers an area of 2,308 km² (7.8% of total area of Armenia). It is one of the most sparsely populated province in the country. It borders the Nakhichevan exclave of Azerbaijan form the west and the Shahumyan Region of the Nagorno-Karabakh Republic from the east. 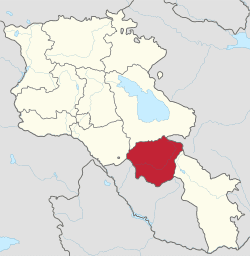 Domestically, it is bordered by the Gegharkunik Province from the north, Ararat Province from the northwest and Syunik Province from the southeast. Historically, the current territory of the province occupies most of the Vayots Dzor canton of the historic Syunik province of Ancient Armenia. Vayots Dzor is mainly a mountainous region. It is mainly divided into 3 ranges: Vardenis mountain range at the north, Arpa range at the middle and Vayk range at the south. At a height of 3522 meters, the Vardenis volcano at the north is the highest point of the province, while the Areni valley, at a height of 850 meters, is the lowest point. Vayots dzor has many rivers, mountains springs and mineral water. Arpa river has the most significant of them. It flows 92 km in the territory of Vayots Dzor. It originates in Vayots Dzor from the northwest hillside of Syunik plateau at a height of 3260 meters, and flows into the Araks river. It has a number of tributaries that form waterfalls such as the Jermuk Waterfall and the Herher waterfall. Yeghegis river is the main tributary of Arpa. It flows into a valley that is protected by the government as a wildlife sanctuary. Most of the rivers in Vayots Dzor are characterized with swift flow, deep fall and inclination. A large project was completed during the Soviet period, to transfer the water of Arpa river to Lake Sevan. Thus, an underground water tunnel was opened in 1981 that starts from the basin of Kechut reservoir to transfer the flow of Arpa river into lake Sevan. A number of small lakes are also found in the valley of Herher river. Vayots Dzor was first mentioned in the Armenian history by Movses Khorenatsi. However, during archaeological excavations, many sites and objects were found in the region dating back to the Paleolithic Era and the Bronze Age. Carvings on cliffs depicting scenes of hunting and animals were also found. As a result of the archaeological studies, historians assumed that the region has been settled since prehistoric times. The Areni-1 cave complex -including the 6100 year-old Areni-1 winery- discovered in the archaeological excavations conducted between 2007 and 2011, revealed that the region was settled during the 5th millennium BC (Late Chalcolithic Age). The winery consists of fermentation vats, a wine press, storage jars, pottery sherds, and is believed to be the earliest known winery in history. Archaeologists had also found a 5500-year-old leather shoe. As early as the 8th century BC, the area of modern-day Vayots Dzor was part of the Kingdom of Urartu. Later, it became part of the Kingdom of Armenia forming the Vayots Dzor canton of the Syunik Province. 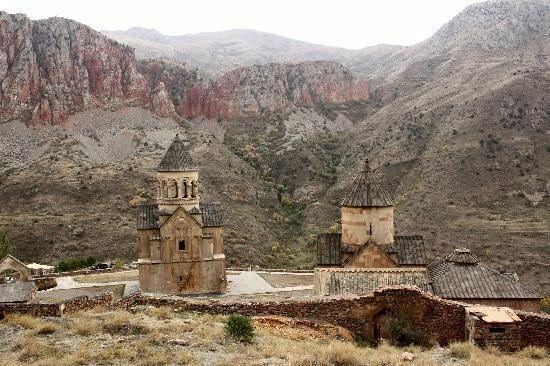 Many churches, monastic complexes, bridges and caravanserais were built between the 10th and 13th centuries, when Vayots Dzor was part of the Kingdom of Syunik under the rule of the Siunia dynasty. During the Middle Ages, the Silk Road passed through the area of Vayots Dzor, particularly the road that currently links the town of Martuni with Yeghegnadzor. Vayots Dzor was home to one of the earliest higher educational centres of medieval Armenia, the University of Gladzor; founded around 1280 by Nerses of Mush. The period between the 15th and 17th centuries is considered to be the darkest period in the history of Vayots Dzor. The region became a frequent battlefield between the invading troops of the Turkic and Iranian tribes. As a result, many monuments and villages were destroyed and the population was displaced. During the 1st half of the 19th century, following the Russo-Persian War of 1826-1828 and the resulting Treaty of Turkmenchay (1828), Vayots Dzor passed from Iranian to Russian rule. In the same year the territory passed to the Russians, it was incorporated into the new Armenian Oblast, while some years later, it became part of the Sharur-Daralagezsky Uyezd of the Erivan Governorate. Between 1918 and 1920 it was included in the short-lived Republic of Armenia. After the Sovietization of Armenia, Vayots Dzor became one of the regions that resisted against the Soviet rule and formed the unrecognized Republic of Mountainous Armenia under the leadership of Garegin Nzhdeh. However, after falling to the Bolsheviks in July 1921, Vayots Dzor became part of the Armenian SSR. During the Soviet period, modern-day Vayots Dzor was divided into the raions of Yeghegnadzor and Azizbekov. After the independence of Armenia, the 2 raions were merged during the 1995 administrative reform to form the Vayots Dzor Province. The population and density in Vayots Dzor is the least among the provinces of Armenia. According to the 2011 official census, Vayots Dzor has a population of 52,324 (25,740 men and 26,584 women), forming around 1.7% of the entire population of Armenia. The urban population is 18,449 (35.26%) and the rural is 33,875 (64.74%). The province has 3 urban and 41 rural communities. The largest urban community is the provincial centre of Yeghegnadzor, with a population of 7,944. The other urban centres of Vayk and Jermuk have a population of 5,877 and 4,628 respectively. With a population of 4,460, the village of Malishka is the largest rural municipality of Vayots Dzor. The majority of the Vayots Dzor Province population are ethnic Armenians who belong to the Armenian Apostolic Church. The regulating body of the church is the Diocese of Vayots Dzor, headed by Archbishop Abraham Mkrtchyan. The Holy Mother of God Cathedral (known also as Surp Sarkis) in Yeghegnadzor is the seat of the diocese. A percentage of the population in Vayots Dzor have their ancestors migrated from the Iranian towns of Salmas and Khoy in 1829 and 1830. The people of Vayots Dzor are mainly conservative. They celebrate the religious and traditional feasts, including Trndez and Vardavar. A key celebration is the harvest festival, that is celebrated every year in Yeghegnadzor on the second Sunday of October. Locals from all villages take part in the parade on cars decorated with flowers, bringing their own crops, berries typical to their territories. Theatrical shows and concerts are being held during the festival. Another popular celebration in the province is the wine festival, which is celebrated annually during the month of October, in the village of Areni. The traditional Armenian lavash and gata are still baked in traditional tandoors at the villages of Vayots Dzor. Local dishes include sour banjar, kyalaglosh, shorva with ghavurma, rabbit kofta, portridge shorva, rosted quail and kid barbecue. Yeghegnadzor is the cultural centre of Vayots Dzor Province. It has a cultural palace, a public library and an archaeological museum. The town's public park is home to a vishapakar (dragon stone) dating back to the 2nd millennium BC. "Vardadzor" monthly is the regional newspaper of Vayots Dzor. It is being published in Yeghegnadzor since 15 November 2002. It covers political, economical and regional news. It also has a literary supplement. The M-2 Motorway that connect Armenia from north to south, passes through the province. On the other hand, the towns of Yeghegnadzor are domestically connected through a number of well-developed roads. The Jermuk airstrip is located near Jermuk, adjacent to the Kechut Reservoir. Vayots Dzor has the poorest agricultural index among the Armenian provinces, forming 2.2% of the annual total agricultural product of Armenia. Around 82.5% (1,903 km²) of the total area of the total area of the province arable lands, out of which only 8.5% (162 km²) are ploughed. However, agriculture -including farming and cattle-breeding- is the most common activities in the province. Agricultural crops include apricot, cherry, pear, peach, apple, quince, plum, melon, walnut, grapes and berries. Cattle-breeding includes wool-bearing, goat farming, poultry farming and bee-keeping. The industry of Vayots Dzor contributes by 1% in the annual total industrial product of Armenia. Industry is mainly based on water battling, alcoholic drinks production (mainly wine), food-processing and dairy products. 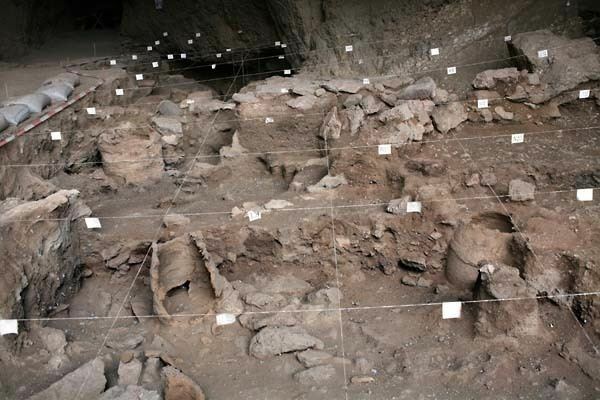 The discovery of the 6100 year-old Areni-1 winery has provided increased awareness of the ancient tradition of wine-making in Armenia and particularly in the region of ancient Syunik. "Getap Wine Factory" (Vedi Alco Winery branch), opened in 1938 in Getap. "Maran Winery", opened in 1992 in Yeghegnadzor. "Areni Wine Factory", opened in 1994 in Areni. "Old Bridge Winery", opened in 1998 in Yeghegnadzor. "Getnatoun Winery" (wine, brandy), opened in 1999 in Yeghegnadzor. "Vayk Group Winery" (wine, vodka), opened in 2000 in Vayk. "Ginekar Winery", opened in 2000 in Aghavnadzor. "Mets Syunik Winery" ("Matevosyan Wine"), opened in 2001 in Aghavnadzor. "Zorah Wines", opened in 2001 in Rind. The company's "2010 Zorah Karasi Areni Noir" was ranked in the 2012 Bloomberg's top 10 list. "Areni Wine Winery", opened in 2003 in Areni. "Hin Areni Vinyards", opened in 2007 in Areni. "Trinity Canyon Vineyards", opened in 2009 in Aghavnadzor. Yeghegnadzor has many plants for cheese and other dairy products. The town is famous for its goat cheese produced by the "Golden Goat" factory founded in 2000. It is also home to the "Selim LLC" for dairy products founded in 2002. Other industrial firms of the town include the "Rafelgrig" for electrical products founded in 1968, the "Izoton" company for oak-wood made barrels for wine and brandy aging founded in 2003, and the Yeghegnadzor Cannery operating since 2015. Vayk is home to the "WCW of Vaik" building materials factory founded in 1968, the "Arpi Mineral Waters Factory" founded in 1973, and the "Meg Ararat" factory for tea production founded in 2008. Jermuk is known for its mineral water production. The main water bottling factories of Jermuk are the Jermuk Mayr Gortsaran founded in 1951, the Jermuk Group founded in 1999, and the Jermuk Service Enterprise founded in 2014. 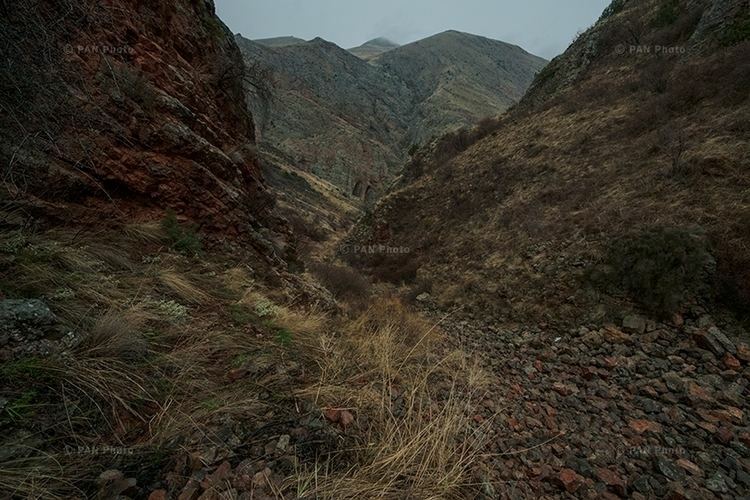 There are many small plants for building materials production in the villages of Areni, Agarakadzor and Yeghegis, while the village of Malishka is home to a jewelry plant. The cultural heritage and the natural monuments of the region attract a number of tourists. Jermuk and the surrounding forests are a tourist attraction with many sanatoriums, spa resorts and its ropeway. It is considered the centre of medical tourism in Armenia. A number of areas of the province are listed as wildlife sanctuaries, including the Herher Open Woodland Sanctuary, the Jermuk Forest Sanctuary, the Jermuk Hydrological Sanctuary, and the Yeghegnadzor Sanctuary. The Mozrov Cave was found in 1980 near the village of Arpi. It is protected as a natural and cultural monument of Armenia. 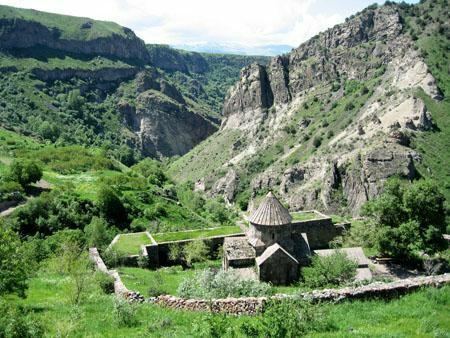 Vayots Dzor was home to the medieval Armenian University of Gladzor that was established around 1280 by Nerses of Mush and operated until 1340 and "left behind a rich intellectual heritage". Currently, the Yeghegnadzor branch of the Armenian State University of Economics is operating in the province since 2008. As of the 2015-16 educational year, Vayots Dzor has 51 schools. Arpa FC of Yeghegnadzor -founded as Momik FC in 1992- used to represent the town in the Armenian Premier League football competition. Like many other Armenian football clubs, Arpa FC was dissolved in early 2003 and is currently inactive from professional football. The towns of Vayk and Yeghegnadzor have a football stadium each with minor capacities. Every year, during the month of August, Jemruk hosts the FIDE Grand Prix Jermuk chess tournament. As of February 2017, Vayots Dzor is home to the following 29 administrative communities (hamaynkner), of which 3 are urban, and 26 are rural.